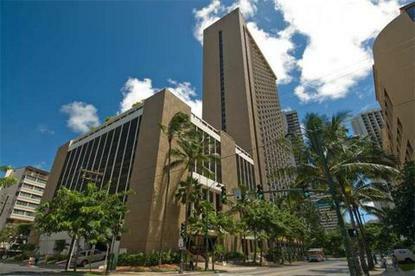 The Hilton Waikiki Beach hotel, located in the heart of Waikiki, is just steps from the famous Waikiki Beach. Following a $65 million renovation, this beautiful Hawaiian hotel property is a blend of modern, understated elegance combined with true Hawaiian character. All the best that the Waikiki area of Honolulu has to offer is easily accessible. Whether business or pleasure brings you to the Island of Oahu, the Hilton Waikiki Beach hotel is the perfect choice for your visit to Honolulu.An exciting new addition to our Hawaii hotel is MAC 24-7, featuring modern American cooking influenced by fresh local ingredients, 24 hours a day, 7 days a week. No other Waikiki hotel restaurant offers breakfast, lunch and dinner round the clock, so no matter where you're coming from or when you arrive, you'll find something to satisfy your cravings.With your comfort in mind, the Hilton Waikiki hotel is 100% smoke-free and offers valet-only parking as part of its top tier service. The hotel features technologically advanced amenities including our proprietary GuestLink system to redefine your in-room experience.Offering the business amenities of a large conference hotel with the personalized service of a much smaller hotel, the Hilton Waikiki hotel staff caters to its corporate clientele with characteristic Hawaiian spirit.Visiting the island just for fun? Our helpful Concierge will direct you to nearby attractions including the Honolulu Zoo, Waikiki Aquarium, Kapiolani Park and Waikiki Beach. Our Hawaiian hotel is also convenient to the Bishop Museum, Iolani Palace, USS Arizona Memorial and many other Honolulu attractions and is only nine miles from Honolulu International airport (HNL).